Reply headed 'For Mr Brughan' consisting of two recipes. Summary Reply headed 'For Mr Brughan' consisting of two recipes. 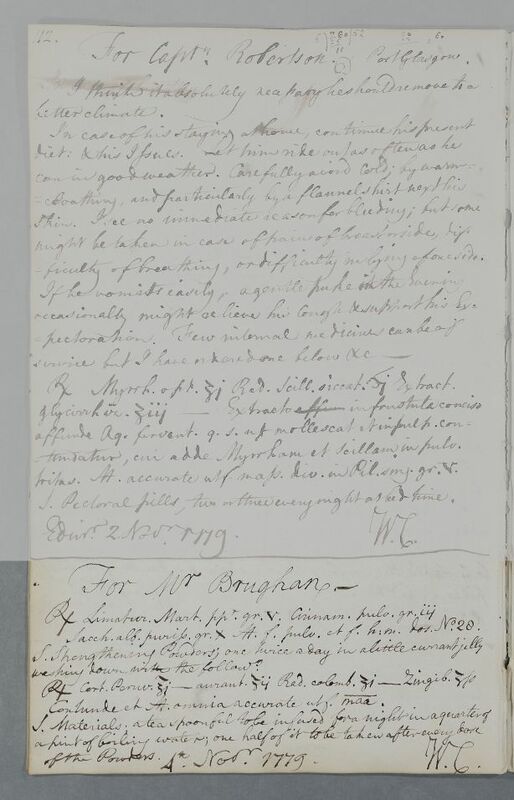 Case of Mr Brughan who is prescribed a strengthening powder. Take one ounce of Peruvian Bark, two drachms of aurant, one drachm of colombo Root and half a drachm of Ginger. Bruise and mix all accurately and make [maa?] Label: Materials, a teaspoonful to be infused for a night in a quarter of a pint of boiling water; one half to be taken after every dose of the Powders. Sacch. alb. puriss. gr. X ℳ. f. pulv. et f. h: m. dos. No. 28.